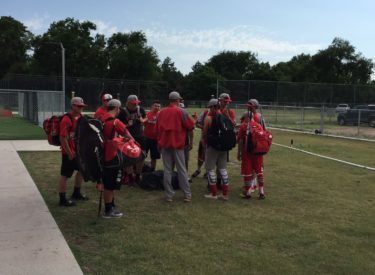 The Liberal Rattler 18U team went 4-1 and placed second in Garden City this weekend. The Rattlers beat Widefield, Colorado 9-0, Goodland 8-3, Ulysses 10-2, and Colby 10-2. They lost to the host Finney County 7-2. In game one Friday against Widefield, Braxton Hyde pitched four scoreless innings for the win. Kaleb Wilmes pitched one scoreless inning. Cole Evans was 2-2 with a double while Elijah McCarter, and Pauncho Terrazas had two hits a piece. Saturday, the Rattlers beat Goodland 8-3. Tucker Deaton pitched 5 and 1/3 for the win. Cesar Burciaga doubled in the win. McCarter, Hyde, and Terrazas had two hits a piece. The Rattlers then took care of Ulysses 10-2. Max Valles pitched three strong innings for the win and Alex Yanez went two scoreless innings. Hyde, Burciaga, Deaton, and Evans all had triples. McCarter doubled. Sunday the Rattlers advanced to the title game with a 10-2 win over Colby. Kaleb Wilmes pitched six strong innings for the win. Hyde and Evans tripled and McCarter, Evans, and Terrazas doubled. Terrazas was 3-3 while Evans, Burciaga, and Yanez had two hits a piece. Finney County won the championship 7-2. The Rattlers had two hits and built a 4-0 lead after two. Hyde pitched five strong innings allowing just two earned runs.